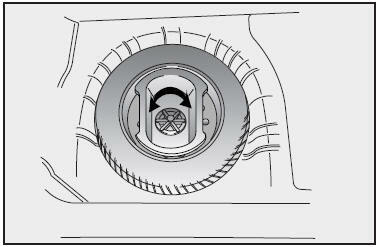 Turn the tire hold-down wing bolt counterclockwise. Store the tire in the reverse order of removal. To prevent the jack, jack handle, and tool bag from “rattling” while the vehicle is in motion, store them properly. Your vehicle is equipped with a compact spare tire. This compact spare tire takes up less space than a regular-size tire. This tire is smaller than a conventional tire and is designed for temporary use only. This spare tire should be used only for VERY short distances. Compact spares should NEVER be used for long drives or extended distances. The compact spare (if equipped) should be inflated to 60 psi (415 kPa). Under no circumstances should you exceed 80 km/h (50 mph); a higher speed could damage the tire. Avoid driving over obstacles. The compact spare tire diameter is smaller than the diameter of a conventional tire and reduces the ground clearance approximately 25 mm (1 in. ), which could result in damage to the vehicle. Do not take this vehicle through an automatic car wash.
Do not use tire chains on this tire. Because of the smaller size, a tire chain will not fit properly. This could damage the vehicle and result in loss of the chain. This tire should not be installed on the front axle if the vehicle must be driven in snow or on ice. The compact spare’s tread life is shorter than a regular tire. Inspect your compact spare tire regularly and replace worn compact spare tires with the same size and design, mounted on the same wheel.